Europa Star Writes About RGM in American Watch Report — RGM Watch Co. In the place where the erstwhile giants of American watchmaking, including Hamilton Watch Company, were established, near Lancaster, Pennsylvania, we met Roland G. Murphy. This master watch restorer founded the RGM Watch Company brand in 1992, the only American watchmaker still producing its own mechanical movements. He represents an isolated, independent mind on the other side of the Atlantic, far away from the Swiss ecosystem. RGM Watch Company is housed in a former bank in the small town of Mount Joy, Pennsylvania. It’s a solid brick-built structure with a vintage but still very reliable safe. On the ground floor, three watchmakers are busy at their workbenches. After the tour, the discussion begins with Roland G. Murphy, one of America’s only master clock and watchmakers. “The United States has always been a country oriented towards mass watch production, before everything moved to Asia,” says Roland Murphy. “The large factories in our region operated very differently from our craft workshops. In a sense, I am an heir to this watchmaking tradition, but an heir with a very different face.” He feels closer in spirit to the likes of Kari Voutilainen, Svend Andersen, Peter Speake-Marin or the Grönefeld brothers. However, it was at the Hamilton facilities in Lancaster that it all began for the native of Maryland. Before Hamilton he completed an apprenticeship as a carpenter. During that time he took a job with Danecker Clock Co. where he worked on the wooden cabinets for clocks. When the company went bankrupt, Roland Murphy bought the stock of clocks and began to analyse their movements. This was the beginning of a passion that still grips him today. He joined a technical school in Pennsylvania (which has since closed its doors) to take a watchmaking course, before flying to Switzerland in 1986, where he perfected his skills at Wostep in Neuchâtel. Back in the United States, he was hired by SMH to work on product development for the Hamilton brand in Lancaster. However, Roland Murphy did not really feel at home in a group, where individual initiative is necessarily limited by the many constraints, work meetings and hierarchical superiors. Besides, he missed working with his hands. He decided to leave the group. Hamilton, meanwhile, would relocate permanently to Biel in 2003. He is operating under additional constraints, far from Switzerland’s watch supply chains. At the beginning of the 1990s, there were just a handful of independent master watchmakers, a new generation led by François-Paul Journe, Franck Muller, Antoine Preziuso and Vincent Calabrese – a far cry from the current Carré des Horlogers! When he founded RGM Watch Company in 1992, Roland Murphy was one of the early birds of this “new wave” in watchmaking. Fortunately for him, the watchmaker initially acquired a large number of Nivarox assortments via third parties, which he still uses today. The first models were skeletonized column-wheel chronographs equipped with Valjoux movements. With the help of Jean-Daniel Dubois (now director of Vaucher Manufacture), then at Lemania, he was also able to launch several small series of tourbillon, minute repeater and perpetual calendar watches. At the same time, he continues to work as a restorer of vintage timepieces, providing after-sales service in the United States for brands such as Sinn, Eberhard & Co. and Titoni. This supports RGM’s activity as an independent brand, with a dozen employees today. In 2007 the RGM Watch Company launched its first in-house movement after seven years in development. Today, the company has four Made in America calibres, for an annual production of some 250 watches. The brand has specialized in the segment of custom-made models, a growing niche, as well as in the trade-in of second-hand timepieces against new RGM watches. Today, the company has four Made in America calibres, for an annual production of some 250 watches. Current collections include the Pennsylvania series, which ranges from models under $10,000, equipped with custom cases, with parts made by a local aerospace industry supplier (! ), to a tourbillon model in steel priced at $95,000. For the company’s twentieth anniversary in 2012, the Calibre 20 was launched on a model with guilloché dial and precise moon-phase indication. The most recent movement developed by Roland Murphy and his team is the Calibre 801 with a sweep second, inspired by Patek Philippe’s classic central second system. The watchmaker is currently working on a new higher-end calibre, similar to the Zenith 135 or the Peseux 260.RGM Watch Company also uses ETA movements to offer more accessible watches, such as the 151 model priced at $3,000. The company even offers its vision of Americana through the Baseball Watch model. 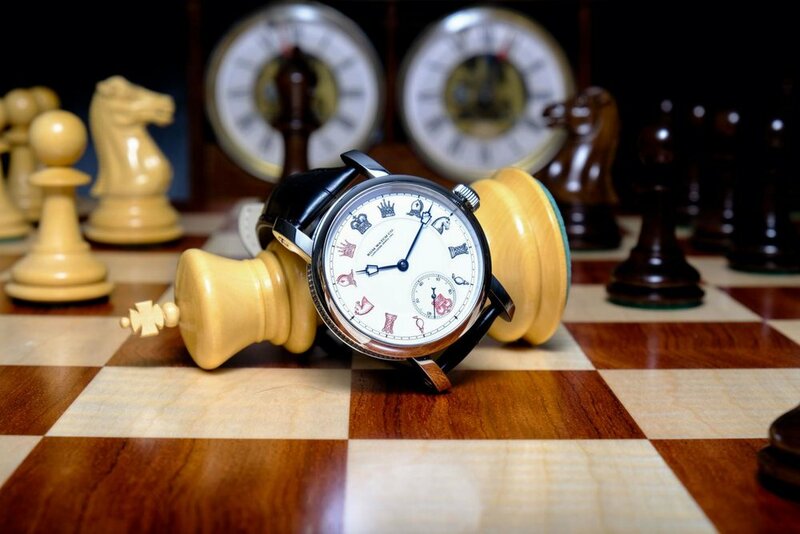 RGM Watch Company took the drastic step of withdrawing from the dozen or so points of sale that represented it in the United States. “By getting rid of this margin, it also allowed me to offer more affordable models,” continues Roland Murphy. “In the end, we reduced production and increased our margins. With the advent of the internet, we have really grown, especially thanks to the impact of social networks and the support of specialized blogs.” The watchmaker manages the Instagram account of his brand himself. With his experience as a restorer, the watchmaker doesn’t want to hear about using silicon in his calibres: “When I think of a watch, I think of its repair in several decades’ time. Too few brands take this into account. This is also why independents are so popular with collectors. We’re dealing with humans, not technocrats.” Roland Murphy’s succession seems to be assured, since his son-in-law works for the company, and his son has just graduated with a specialization in CNC operations. The citizens of his region are no longer exposed to the importance of the watchmaking industry, however. “Many people are unaware of the long industrial and watchmaking heritage of our territory, despite the presence of the National Museum of Watchmakers and Clockmakers.” So, with his good humor and sincere speech, Roland Murphy acts as a salutary reminder, which may lead to new vocations among those whose grandparents devoted their lives to watchmaking.